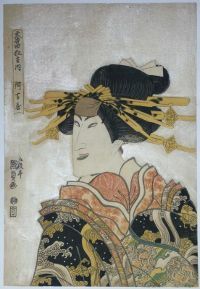 A bust portrait of the onnagata actor Nakamura Matsue III as the courtesan Akoya. A part he played at the Nakamura theatre, 9/1814, in the play Dannoura kabuto gunki, Battle Tale of Dannoura.” The story tells of Akoya’s loyalty to her Heike lover Taira no Kagekiyo when on being captured she convinces Kagekiyo’s enemies of her ignorance of his hiding place aided by her exquisite music. From Kunisada’s finest set: Oatari kyoden no uchi, “Great Performances.” A set of seven prints of celebrated roles of the previous eight years selected from the Oatari kyoden, “Big Hits.” Sumptuously produced with mica grounds which had not been used for twenty years. Exceedingly rare, on a par with many Sharaku prints. Published by Fukusendo, c 1815. Another impression is in the Museo d’Arte Orientale “Edoardo Chiossone,” Genoa ( S1396 ) and a second is in the Ronald Cavaye collection. Fine impression. Turning of colour towards bottom right, otherwise good colour. Mica good. Slight staining au verso which shows through mica, otherwise good condition. Full size. Signed Gototei Kunisada ga.